The Meizu Pro 6 is two days away from being unveiled during a rather busy stretch of time. The Huawei P9 was introduced last week, and tomorrow HTC will announce the HTC 10. Add the Meizu Pro 6 to this list. The handset's claim to fame is its limited exclusivity on the MediaTek Helio X25 chipset that is under the hood, providing the phone with a deca-core CPU and the Mali-T880 MP4 GPU. The handset features a 5.2-inch AMOLED screen with a resolution of 1080 x 1920. 4GB of RAM is inside, and the phone will feature a version of Force Touch that is limited in use to native apps. The handset offers dual nanoSIM capabilities, and a 21MP camera adorns the back of the unit. A 5MP snapper is on front to handle selfies and video chats. Android 6.0 is pre-installed. 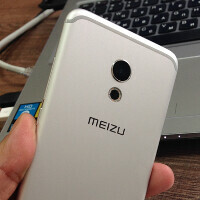 According to the latest reports, during Wednesday's introduction we might also see the Meizu Pro 6 Plus introduced. A number of new photos of the Pro 6 are available for your perusal by clicking on the slideshow below. We also have images of the handset's trip through the AnTuTu benchmark site where the phone scored 91,165. Some of you will no doubt consider that quite a disappointment considering that the 100,000 bar has already been topped by several high-end models. Yeah, Helio X25 is much weaker on the GPU side than Exynos 7420 inside Pro 5. Seems like a downgrade. No exynos No glory ! Waiting for real benchmarks before dropping verdict. It barely beats Kirin 950 while kirin 955 , Exynos and Snapdragon are miles ahead. I'm sure the 950 is more efficient. I got a mate 8 on Saturday and this battery is amazing. The phone in this leak must be the MX6 and not the Pro 6 because why would Meizu downgrade their 2016 flagship from the Pro 5(2015 flagship), Also the Pro 6 was rumored to have a 5.5in QHD screen, again why lower the screen size from last years flagship? Really like that antenna design. Front looks like an iPhone with the Galaxy home button. Clearly the challenge is how to design a phone that stands out using a tried and true form factor. I like the design of the antenna lines on the back but the front is beginning to look generic and uninspired. Still Pro 6 wouldn't be as powerful as Pro 5.